Drop in between 2 and 5 pm on September 19, October 10, and November 14, 2018 with any questions you have about the job search process. Need advise on putting together resumes? Looking at future careers? Need help navigating the digital world of job searching? 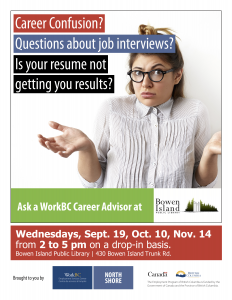 Chantal Rackley of WorkBC North Shore will be in the library Annex to help answer your questions.These one-on-one drop-in sessions are free! Chantal Rackley is a Certified Career Development Practitioner (CCDP) and career advisor at the WorkBC North Shore. She has over 13 years experience advising and facilitating in the area of career planning and strategic job search. She is a regular contributor to the YWCA Employment Blog and has collaborated with Charity Village on blogs and a webinar. She has recently received her certification in delivering and interpreting the Myers Briggs Type Indicator (MBTI) and Strong Interest Inventory.